Village Craftsmen is happy to announce a new policy re. mail orders. We have been shipping pottery, jewelry, glassware, kitchen utensils, and much more for decades. The shopping cart software we use is efficient, and dependable...but we have never been entirely satisfied with the way it calculates shipping and handling charges. So we have decided to try a new policy. For the months of August and September we are waiving UPS Ground shipping charges for mail orders that total $25 or more. You heard that correctly. Shipping is FREE for mail orders of $25 or more! Do your Christmas shopping early and Save!! Click here to go directly to our on line mail order catalog: http://www.villagecraftsmen.com/catalog.htm. If this venture works well we may consider extending it. Keep posted! Our latest Ocracoke Newsletter is Lou Ann's story of the Night Blooming Cereus Cactus. You can read it here: http://www.villagecraftsmen.com/news072111.htm. Friday night is my poker night. We've been playing for twelve years now, every Friday night, 8 o'clock until midnight. Early this morning, with thirteen more dollars in my pocket, I rode my bike back home, down Howard Street. Lou Ann was still up, so we took a sleeping bag and pillows out into the front yard to look for shooting stars before going to bed. The night sky was spectacular...the Milky Way strewn across the vault of heaven. Lying on my back, scanning the sky I thought about my high school science teacher. We were studying astronomy, and he had rented a movie, "The Milky Way." He pulled down the window shades and we settled back as the projector whirred and the screen lit up. Cows were walking across a meadow. Cows were herded together. Automated milking machines were attached. It was a movie about dairy farming! We watched the movie anyway. For the past several nights Lou Ann & I have been scanning the night sky, looking for shooting stars. Ocracoke is a great place to see these heavenly displays. There is much less light pollution than in metropolitan areas with street lights and twenty-four hour illumination. This is especially true out on the beach, away from the village. Wednesday night at about 10:30 we were simply sitting on the porch swing, with only a small patch of sky visible, when an especially bright meteor streaked across the sky below the North Star. Just before it burned out it flashed even brighter than earlier. Then, in an instant, it was gone. We walked out into the yard, and with necks craned back, gazed up, hoping to see more shooting stars. We saw one more, but it was getting late, so we headed inside. Saturday, August 13, is the height of the annual Perseid Meteor Shower. Unfortunately, that is also the time of the full moon. But keep looking up into the night sky. The number of shooting stars will be increasing as August 13 nears. You can read more here: http://stardate.org/nightsky/meteors. Out latest Ocracoke Newsletter is Lou Ann's story of the Night Blooming Cereus Cactus. You can read it here: http://www.villagecraftsmen.com/news072111.htm. I recently read an article by Rebecca J. Rosen in the July 14 issue of The Atlantic, "Keepin' It Cool: How the Air Conditioner Made Modern America" (http://www.theatlantic.com/national/archive/2011/07/keepin-it-cool-how-the-air-conditioner-made-modern-america/241892/) where she praises this transformative modern technology. As much as I appreciate the 78 degree indoor temperature at my house (especially after mowing the grass and weeding the garden in mid-afternoon July temperatures!) I am not so enamored of many of the other changes wrought by air conditioning that Rosen finds so praiseworthy. Rosen writes that, "many [older] homes had porches where families could spend a hot day, and also sleeping porches with beds where they could ride out a hot night.... Besides housing design, people had other tricks: taking naps during the heat of the day, carrying hand-held fans around, and, of course, swimming." She continues: "Houses [today] are designed not for ventilation but for central cooling systems. Porches, where they exist, are relics of another age, and few new homes include them. Families gather inside, in the comfort of 72-degree living rooms, to watch TV." Perhaps it is time to re-invent the porch...where families can gather late in the afternoon to wave to passers-by, or to chat with neighbors who stop for a visit. Maybe a sleeping porch is not such a bad idea either. Imagine sleeping with a mild breeze blowing over you, listening to crickets, and watching lightning bugs flit by as your eyelids close in sleep. Then, of course, there is the mid-day nap, funeral parlor fans...and swimming! Sure, I know that modern life (office jobs, school, etc.) doesn't leave much time for naps and mid-day swimming, but wouldn't it be nice to bring back just a little more of that sense of community and a slightly more relaxed lifestyle? Wave when you walk by our house on Lawton Lane. We're often sitting on the porch in the morning, and in the late afternoon! Our latest Ocracoke Newsletter is the story of the Night Blooming Cereus Cactus, by Lou Ann. You can read it here: http://www.villagecraftsmen.com/news072111.htm. My daughter Amy lived in Germany for a year and a half about twenty years ago. Last week she had a phone call from her friend Jule (pronounced Yul-eh) who lives in Berlin, and who has visited Ocracoke several times. Jule explained that she had had an appointment at the hair salon, and had arrived early. She sat down to wait, and picked up the latest issue of "Brigitte," a popular weekly magazine. She casually flipped through the magazine. Imagine her surprise when she saw a photo of Fiddler Dave on page 134! It was part of a seven page article about eastern North Carolina and Ocracoke. "Die kleinen Städte an der Atlantikküste North Carolinas sind gemütlich, die Inseln der davorliegenden Outer banks winzig und die Herzen der Bewohner XXL. Sie laden Fremde auf ihre Veranda ein, teilen mit ihnen Wein und Meerblick und dieses ganz besondere Südstaatengefühl." My rough translation: The small towns on the Atlantic coast of North Carlonina are easy-going, the islands of the off-shore Outer Banks tiny, and the hearts of the inhabitants XXL. They invite stangers up on their porches, share with them wine, and a view of the ocean, and that extra-special Southern hospitality. I haven't checked to see if the article is on line, but you could look for it yourself at http://www.brigitte.de/. Our latest Ocracoke Newsletter is Lou Ann's story of the Night Blooming Cereus Cactus. You can read it here: http://www.villagecraftsmen.com/news.htm. Mama, Mama, may I go swimming? But don't go near the water! Several days ago a reader asked about the WWII ammunition dump on Ocracoke Island. In 1942 the US Navy built a large facility on the island. It was instrumental in stopping U-boat attacks off the North Carolina coast. In addition to construction of the base (near the Coast Guard station) the Navy paved the first road on Ocracoke. A portion of that road ran from the present-day firehouse, alongside where the Ocracoke Coffee Co. is situated today, to the "T" at the end. Off the "T" the Navy paved short aprons. It was there that they stored ammunition. The road became known as "Ammunition Dump Road." Today it bears the more sanitized, official name, "Sunset Boulevard." Although the word "dump" suggests spent ammunition, this was an area set aside to store live ammunition. A security gate, with gatehouse, was erected several hundred feet before the "T." A security guard was posted there to keep unauthorized people out. At each apron the Navy built wooden sheds where they stored the ammunition. The sheds were nestled against a sandy ridge, and more sand was banked up around them. After the war the base and ammunition dump areas were abandoned. Blanche remembers being with friends, and they would climb up the ridge to gain access to the roofs of the ammunition sheds. From that vantage point they could see all the way to the ocean. Eventually all of the Navy buildings were either dismantled or moved. Today, all that remains is the large round cistern near the NPS Visitors Center...and portions of several other structures at the edge of the village (but that is a story for another post or Newsletter). It has been busy lately. Stefen and his family have been here for two weeks. It was so much fun to watch them frolicking in the surf...and to join them laughing, jumping, and catching waves (there have been some great body surfing waves lately!). I was able to get my outboard motor purring like a contented kitten just before they arrived (it needed a new fuel pump), so they spent several days knee-boarding (similar to water skiing) in the sound. Sometimes they just motored out near Teach's Hole to swim or look for a few clams. 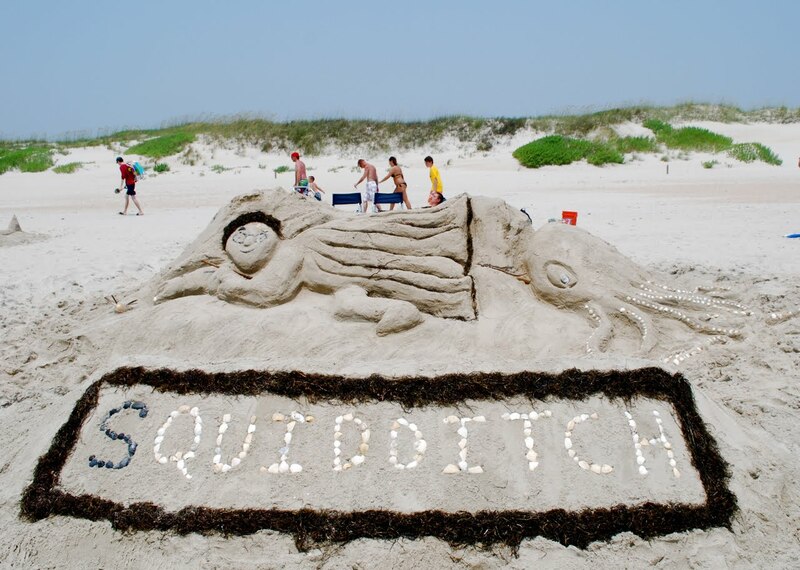 They went to shows at Deepwater Theater, laid in wait for Ghost Walks (they built an "air cannon" to startle folks), built sand castles, shopped, listened to island music, played cards, rode bikes, and enjoyed the near-perfect weather. On Thursday evening we took Eakin's homemade rocket to the beach and launched it. Built from two plastic soft drink bottles filled with water, and pressurized with a bicycle pump, it sailed more than 150 feet into the air. Lachlan thought it was "really cool." Of course, I hated to see them leave! Breaking news about the 2011 OcraFolk School is just in! Details follow. Registration is open and plans are underway for our 2011 Ocrafolk School, October 23-28. For those unfamiliar, the Ocrafolk School is an opportunity to spend an 'in depth' week here on the island sharing great food, music, and interesting workshops with a fun group of people! A 2011 registration form is available at http://www.ocrafolkschool.org/. English Paper Piecing is an old method of hand piecing quilts. By basting fabric onto pre-cut pieces of heavy paper and joining the pieces together with a simple hand stitch you can create a quilt top of any size or design. After learning the basic method, each participant will work on a design of their choosing using squares, diamond, triangle and/or hexagon shaped pieces. No experience necessary but a love of fabric, color and quilts will help you to enjoy this class! (Debbie Block has been paper piecing for more than a dozen years and is still in love with every part of the process). 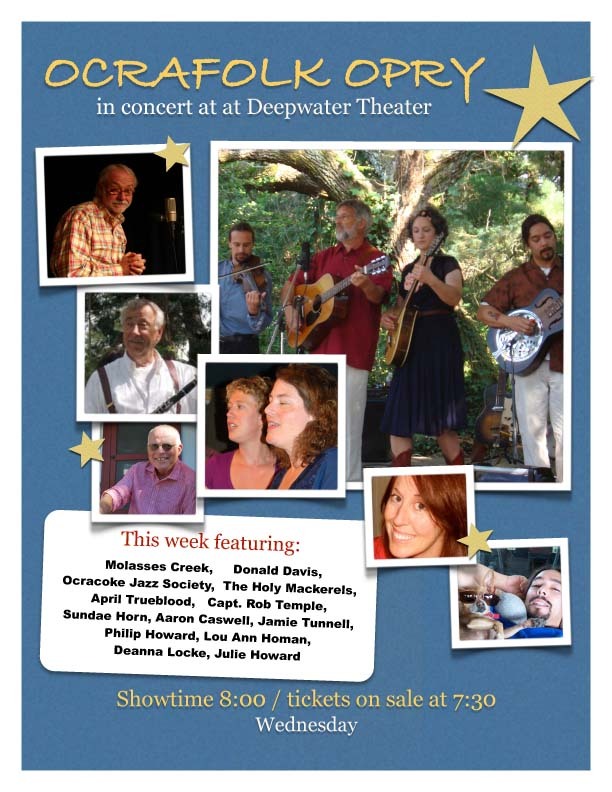 Ocracoke Island is known for having quite a vibrant music scene! We will spend the week 'behind the scenes' exploring and visiting the musicians, rehearsals, recording studios, history, venues and local radio that make it all happen. No musical experience necessary, but if you play an instrument or sing, bring it on (we'll have a 'jam' at the Soundfront Inn, and you also just might get a chance to record at Soundside Studio!). Ocrafolk School is produced by Ocracoke Alive, a non-profit 501(c)3. 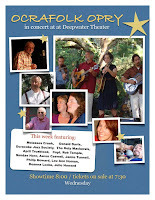 For more information visit http://www.ocracokealive.org/. Our latest Ocracoke Newsletter is Lou Ann's story of a gathering of islanders to celebrate the midnight blooming of a Cereus cactus. You can read it here: http://www.villagecraftsmen.com/news072111.htm. Oh My Gosh! How does it always happen so quickly? But it does. Another year has cycled around...and Lou Ann has another birthday today. Fridays are always busy days for us during the summer months -- We have Ghost Walks...and Lou Ann has her own show with Sundae & Marci from 9 to 10 pm. So we won't be doing much celebrating today. However, my birthday is in less than two weeks. That's why we've decided to treat ourselves to dinner tomorrow night to celebrate both birthdays. Several weeks ago I signed up for Facebook because we decided Village Craftsmen should have that exposure...and I needed to join to be one of the administrators. Frankly, I never wanted to be on Facebook (writing this blog nearly every day often takes more time and energy than I plan on spending at the computer). So...even though I am on Facebook I want all of our readers to know that I don't maintain the Village Craftsmen site (Jude has graciously agreed to do that), and I never look at my personal Facebook page. If you have requested to be my "friend" or have posted a message for me, please accept my apologies for not responding. It is just "not my thing." My life is so full of creative, family, and outdoor activities that I don't want to spend time on one more computer-based endeavor. I'm off to the beach, or on my way to my boat. I'll be back tomorrow! 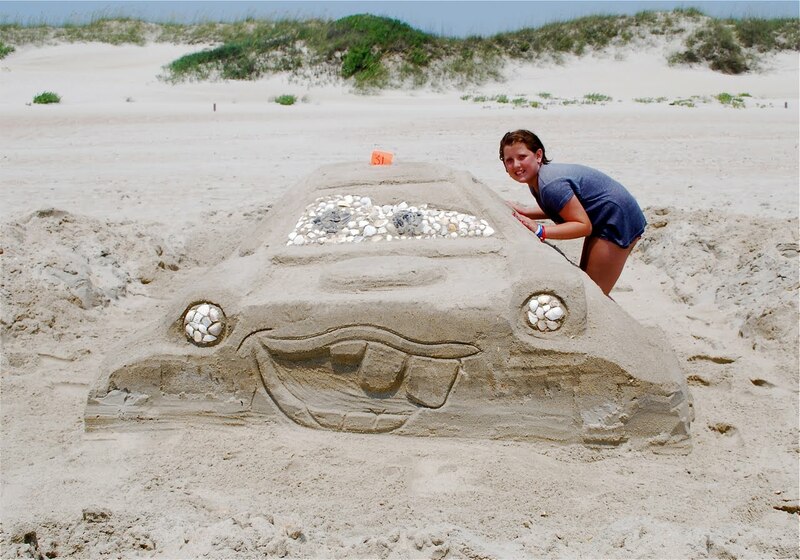 Our latest Ocracoke Newsletter has just been published. It is entitled "Late Night can be Bathed in a Beautiful Light" by Lou Ann. It is her reflective account of a late night gathering of island friends to celebrate the midnight blooming of a Cereus cactus. You can read it here: http://www.villagecraftsmen.com/news072111.htm. Not long ago I took out my ink pens, my watercolor paints, and a pad of watercolor paper. I've been enjoying making small drawings of Ocracoke and other Outer Banks scenes. Then I got a notion to offer them for sale. Since I've been semi-retired at the Village Craftsmen I don't have as many opportunities to interact with visitors...and I sometimes miss that. So I have set up a wooden table on Lawton Lane, with some of my drawings displayed there. All drawings/paintings are matted and framed (5" X 7" black metal frame), and signed. They are ready to display, and sell for $20 each. If I am not at the table you can ring the bell to get my attention...or just drop your money in the slotted box if I have wandered away for a while (in that case I won't get the pleasure of chatting with you, but I will be able to afford fuel for my boat!). Our latest Ocracoke Newsletter is a modern day ghost tale, "Ode to Mrs. Godfrey," by guest columnist Tom McDonald. You can read it here: http://www.villagecraftsmen.com/news062111.htm. Thursday, after dinner, Lou Ann & I took my family out to the beach to watch the full moon rise over the ocean. I gleaned the following three photos from Lou Ann's camera...a small sample of many pictures she had of a spectacular evening display. Click on any photo to view a larger image. After a sweltering day of high humidity and a heat index of around 110 last Wednesday, conditions changed overnight...literally. Thursday dawned bright and beautiful, with "cotton ball" clouds, low humidity, and temperatures in the 70s. My son Stefen, his wife Snee, and my grandchildren, Zoe, Eakin, & Eliza, are visiting for two weeks. We all went out to the beach Thursday evening to watch the full moon rise over the Atlantic as the sun was setting in the west. Lou Ann took pictures. I will share several in the next few days. Temperatures have been slowly climbing the last few days, but it is only in the mid 70s as I write, with the forecast calling for mid to high 80s for the next several days. Our latest Ocracoke Newsletter is a modern day ghost tale,"Ode to Mrs. Godfrey," by guest columnist Tom McDonald. You can read it here: http://www.villagecraftsmen.com/news062111.htm. Fig trees grow all over Ocracoke village. Already many of the figs are beginning to ripen. The photo below is of the tree behind the Ocracoke Preservation Society Museum (click on it to view a larger image). The darker figs will be ready to eat when the sides begin to crack and split. The challenge is plucking them just at the right time...before the birds get to them! Figs on some trees are still tiny, others are larger, but green and hard. They won't ripen for a while. The very complex, remarkable, and thoroughly fascinating story of the relationship between tiny "fig wasps" and figs is told in chapter 10, "A Garden Inclosed," in the book "Climbing Mount Improbable" by biologist Richard Dawkins. He calls the story of the fig "the most difficult and complicated of all [his] stories." It is a story of "strategy," "symmetry," "cooperation," "kinship," "combat," "deception," "struggle," "mimicry," and "police action" (he uses many of these terms metaphorically, at the risk of making much of his explanation sound too purposeful, which he insists it is not). Dawkins describes the relationship between fig and fig wasp as "almost ludicrously tortuous and subtle." Although he admits that his explanation of this "difficult and complicated matter" might "defeat [him]," the 28 page chapter is well worth the time required to read it. Please leave a comment if you've read this fascinating story. Our latest Ocracoke Newsletter is a modern day ghost tale, "Ode to Mrs. Godfrey," by guest columnist Tom McDonald. You can read it here: http://www.villagecraftsmen.com/news.htm. A reader recently asked if there are owls on Ocracoke. Nearly thirty years ago a friendly young park ranger was assigned to Ocracoke. He had a dynamic personality and conducted many of the interpretive programs. He took visitors out to the beach to learn about stars. He shared shipwreck stories by getting people to act out the rescue operations. He opened the lighthouse so folks could see the spiral staircase and understand the keeper's tasks better. The young ranger was also an active member of the community. He was invited to pot luck dinners. He visited residents in their homes. He had many friends. He had his own key to the lighthouse, and he had an idea. Too many islanders had never been to the top of the lighthouse. So he invited one friend, his friend's teen aged son, and the teenager's friend to a midnight excursion to climb the lighthouse. This was a risky venture since he was not authorized to allow anyone else up the staircase...and the chief ranger and his family lived in the keeper's quarters on the grounds. The lighthouse was restricted government property, and he could lose his job if he was discovered. The four interlopers crept up to the lighthouse door, turned the key in the lock, and stepped inside. As quietly as possible they began their climb. At every window they held their breath, fearing their silhouettes would be noticeable to anyone in the keeper's quarters who might be looking their way. Like cornered rats, there would be no escape if they were discovered. The ranger led the way to the top of the spiral stairs. He stepped onto the eight foot ladder that led to the hatch in the lantern room floor, and climbed the last few steps. When he pushed the hatch open the silence was broken by loud, raucous hooting and furious flapping of wings. The four trespassers were startled, surprised, and frightened. One of the lantern room windows had been broken by storm-driven debris, and had not been replaced. A large barred owl had made her nest on the lantern room floor. The ranger and his compatriots quickly retreated, fearing every step of the way that they would be greeted by the chief ranger at the bottom of the lighthouse. As it turned out, they escaped without notice...but with a story to tell. Yes, there are owls on Ocracoke! Our latest Ocracoke Newsletter is a modern day ghost story, "Ode to Mrs. Godfrey," by guest columnist Tom McDonald. You can read it here: http://www.villagecraftsmen.com/news062111.htm. "...Part of NOAA's task has been to comb through ship manifests, naval records, reports of sinkings, insurance documents and survivors' accounts to determine which ships burned and which probably went down with their fuel and cargo. "From that, the agency can work to identify those posing the greatest risk of leaking, and those offering opportunities for salvage operations to recover the oil or other cargo before it becomes a costly spill." I am aware of no leaking fuel tanks off the coast of North Carolina. Although there is no cause for alarm at this time, there is cause for concern. Of course, we hope NOAA is successful in identifying, locating, and salvaging sunken fuel and cargo before problems arise. Quality entertainment is what Deepwater Theater is all about. Folks who come out for the shows, including "You Ain't Heard Nothing Yet" [Monday nights], the "North Carolina Marionette Theater" [Tuesday afternoons], the Ocracoke Opry" [Wednesday nights], "Molasses Creek in Concert" [Thursday nights], and "Bawdy Songs & Stories" [Friday nights], tell us again and again how impressed they are with the amount of talent...and the quality of talent. Ocracoke Island is home to many superb artists, storytellers, and musicians. We have folk and roots bands, guitarists, fiddlers, banjo players, storytellers, a jazz ensemble, and more. The William Ellis Williams house, a traditional island “story and a jump” house that has cedar shake siding, two front dormers (probably a later addition), a hipped front porch, and a rear shed addition, was later moved to a lot where the Anchorage Inn is now located. In 1983 David and Sherrill Senseney acquired the house and moved it to its present site. William Ellis Williams was married to Neva Mae O’Neal (1881-1908), my grandmother’s sister (see my blog posts for January 4 & February 11 of this year, about the lost grave marker). After Neva Mae died (she was only 27 years old) William Ellis married Julia Gaskins. 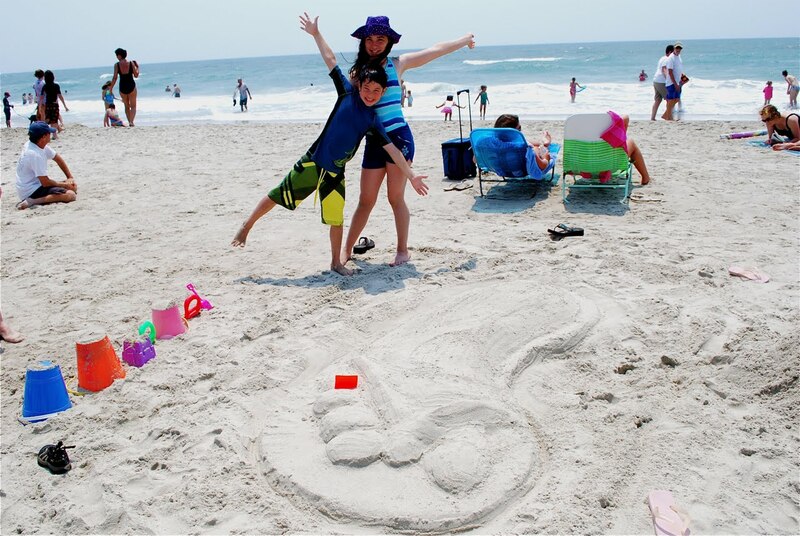 They moved to Ocean City, Maryland and had two children. You Ain't Heard Nothin Yet! Our friend Janet sent us the following photos of the Monday evening show Amy & I put on at Deepwater Theater. It is called "You Ain't Heard Nothing Yet, Strange Stories and Quirky Tales of Ocracoke Island." We started this one hour performance last year. This season we have developed all new stories. 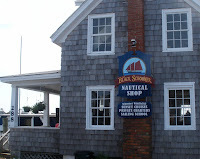 For 2011 we share stories about the US Life Saving Service, including the almost unbelievable rescue of six sailors from the three-masted schooner, Sarah D. J. Rawson, that wrecked at Cape Lookout in 1905. We also tell the humorous story of Ocracoke's first automobile accident, the account of the unusual cargo from the Pioneer (a steamer that wrecked here in 1889), an island ghost story, and the hillarious antics of a quirky old-time islander, "Ma Britty." In addition, David treats the audience with a selection of fiddle music, and we instruct the audience in a number of unique island words and expressions. It is a fun evening and a great opportunity to immerse yourself in interesting island lore. We even provide time to ask the questions you've been pondering...but never knew whom to ask. We hope to see you -- Monday evenings at 8 o'clock at Deepwater Theater on School Road. Admission is $12 for adults, and $6 for kids. Our latest Ocracoke Newsletter is a modern day ghost story, "Ode to Mrs. Godfrey," written by guest columnist Tom McDonald. You can read it here: http://www.villagecraftsmen.com/news062111.htm. Our friend Janet was on the island the week before the 4th of July. She sent a few photos that I decided to share with our readers. Not all of our island moments are filled with ghost walks, opry shows, parades, or musicians on our screened-in porch. Sometimes we are just like normal folks! A couple of days ago I listed most of the known pilots at Ocracoke Inlet. I can only guess that those listed for 1773 were the pilots who helped ship captains avoid the British blockade during the Revolutionary War so that supplies could be carried to General Washington at Valley Forge (see post for Thursday, June 30, 2011). A reader also asked if I could get a photo of cousin Blanche when she was younger. She just smiled when I asked her for a picture, then changed the subject! Sorry. Another reader asked if anyone on the island is a member of the DAR. Blanche couldn't think of anyone, nor could I, but we're not sure. Re. DNA testing and the identity of the men buried in the British Cemetery: We only know the identity of Sub-Lt. Thomas Cunningham and Stanley Craig because Ocracoke native Wahab Howard had met Cunningham some days before in Norfolk, and Craig was wearing his name tag. There has never been any attempt to identify the other two sailors. The best guess about the origin of Ocracoke's once wild ponies is that some were brought to the island by early landowners, and others swam ashore from shipwrecks. They are similar to Spanish mustangs. Lee, a friend of ours, is on the island for about ten days with his three daughters. Lee is an artist and does wonderful caricatures.Here is a photo of him working on the porch at the Black Schooner, Ocracoke's new nautical shop on the docks at the Community Square. And below is one of Lee's caricatures of "yours truly." If you are on the island these next few days you may see Lee somewhere in the village sitting at his easel. Maybe you'll get a drawing to carry home! Some time ago I heard that the Raleigh Tavern in Colonial Williamsburg hosts an evening show of bawdy songs from the colonial era. Ocracoke also has a long tradition of earthy humor. This summer Lou Ann, Sundae, and Marcy have put together an entertaining one hour show of bawdy songs and stories for a discrimitating adult audience. They have scheduled their performance for 9 o'clock Friday evenings at the Deepwater Theater. Shows will continue through early August. If you would enjoy a fun-filled hour of hillarious racy songs and stories be sure to come out to the theater on School Road. There will be riotous laughter and high spirits! Below is a gallery of a few July 4th photos taken by Ruth Fordon, Lou Ann, & our friend Jerry. We all had a great time! Click on any photo to view a larger image. Our latest Ocracoke Newsletter is the modern day ghost tale, "Ode to Mrs. Godfrey," by guest columnist Tom McDonald. You can read it here: http://www.villagecraftsmen.com/news062111.htm. Today I will be trying to catch up after a very full Independence Day on Ocracoke. I will share photos and more stories in a day or two...after I recover from all of the activities! 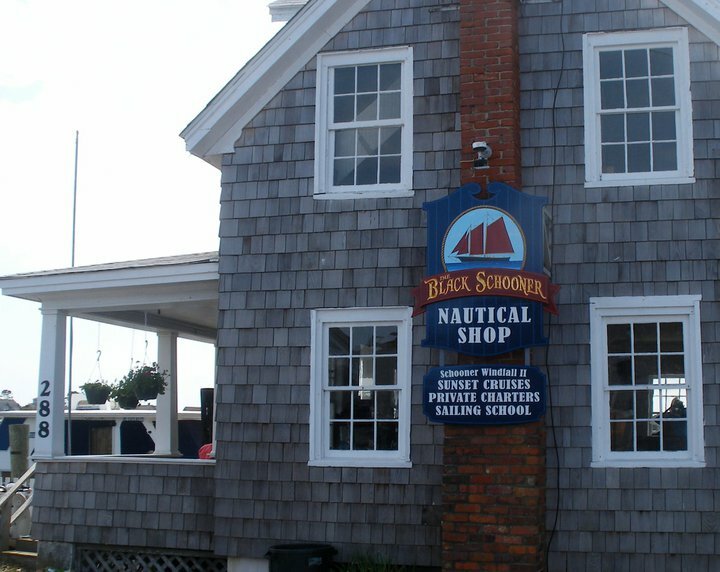 Ocracoke Friends of the Library will be sponsoring a book sale tomorrow, Tuesday, July 5th from 9am - 3pm on the porch of the Ocracoke Library. Ocracoke Friends of the Library members can come at 8:30 to get first pick of all these great books! Membership is easy -- you can join at the door for just $5 for individuals and $10 for families. Ocracoke Friends of the Library is a non-profit organization that promotes literacy and provides support and funding for the Ocracoke Library, and Ocracoke Child Care and Ocracoke School classroom libraries. I will be enjoying today's festivities (flag raising, sand sculptures, sky diving, parade, square dance, etc. )...and will write again tomorrow. In 1715 the North Carolina Colonial Assembly enacted a statute to establish pilots at Ocracoke Inlet. Masters of sailing vessels needed pilots with local knowledge to guide their ships through the inlet, across the bar, and into the ever-changing channels that led to deeper water in Pamlico Sound, and from there to mainland ports. In spite of the 1715 legislation, pilots of record do not appear until almost two decades later. For many years Ocracoke Inlet pilots then played an important role in the history of eastern North Carolina. In addition to providing safe passage to mainland ports, the pilots were required to notify port commissioners of incoming vessels carrying persons afflicted with contagious diseases. A Frenchman, Pierre Auguste [Augustus] Cabarrus (1758-1819), is also known to have been a pilot during the early period. Hatteras Inlet opened in 1846. Because the new inlet was more navigable than Ocracoke Inlet, most of the pilots soon moved to Hatteras. By 1900 only two Ocracoke residents, Samuel Bragg & James Bragg, are listed as pilots. Our latest Ocracoke Newsletter is a modern day ghost story by guest columnist Tom McDonald. You can read it here: http://www.villagecraftsmen.com/news062111.htm. A reader asked recently about the disposal of WWII ammunition on Ocracoke. Below is a related story about one of the many mines that were placed in nearby waters to thwart German U-boat attacks. This account is on page 164 of the book, To Die Gallantly: The Battle of the Atlantic, by Timothy J. Runyan, & Jan M. Copes. I don't remember this incident, so I asked Blanche about it. She had never heard all of the details (she lived on the mainland at her husband's farm for a while), but she confirmed that a WWII mine had been brought up and exploded. "Brown pelicans were once endangered due to the spraying of DDT pesticide on cornfields. The toxic chemicals bled into the waterways and estuaries into the bellies of fish which were then consumed by water birds such as these. The concentrated pesticide inhibited the ability to lay an egg with a structurally sound shell. And even if those eggs affected by DDT didn't crack when they were laid, they were shattered when the mother tried to roost. At one point, the species was almost wiped out. But after the use of DDT was banned in 1972, it gradually recovered. "'Thirty years ago,' [Walker ] Golder [deputy director of Audubon North Carlina] explained, "there was only one colony of pelicans in the state around Ocracoke, around 1980." "Then there were less than 100 brown pelican pairs statewide, but a second colony congregated in the Cape Fear River and the numbers have skyrocketed. "'Today there's about 4,000,' Golder explains. 'Pelicans are a real success story.'" You can read the entire article, "For the Birds" by Jenny Yarborough in the Wrightsville Beach online magazine: http://www.wrightsvillebeachmagazine.com/article.asp?aid=746&iid=93&sud=27. Our latest Ocracoke Newsletter is the modern day ghost story, "Ode to Mrs. Godfrey," by guest columnist Tom McDonald. You can read it here: http://www.villagecraftsmen.com/news062111.htm.